Situated along Table Rock Lake in Indian Point Missouri this resort offers private cottages with free Wi-Fi access. Silver Dollar City is 3 miles away and guests can enjoy access to an outdoor pool. A full kitchen is provided in every air-conditioned cottage at The Cottage Resort. Guests can relax by the flat-screen cable TV or enjoy the outdoor BBQ facilities during their stay. 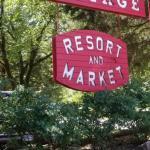 A market with food fish tackle swim gear and more is on site at Indian Point Cottage Resort. Free boat and car parking is also offered at this resort. Payne Stewart Golf Club is 13 miles away. Tourist attractions and entertainment in Branson can be reached in 15 minutesâ?? drive.